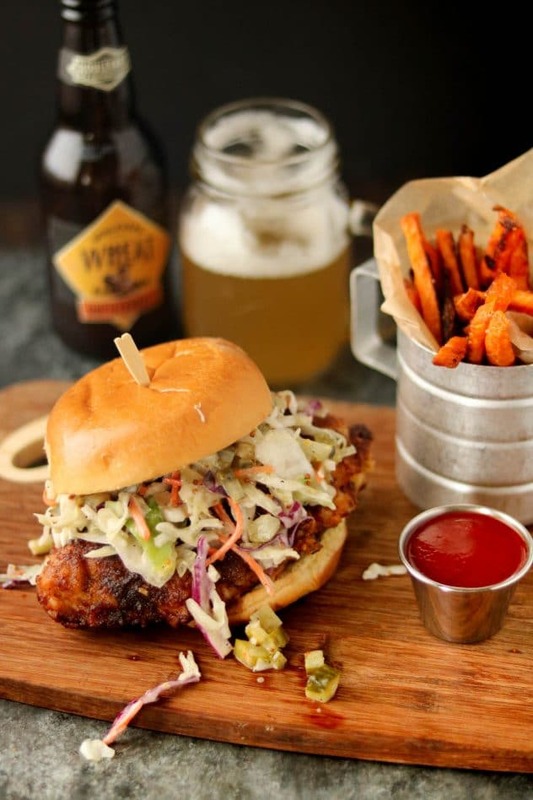 Enjoy the sweet and spicy flavors of the famous Nashville Hot Chicken with these Nashville Hot Chicken sandwiches. I’ve also made this recipe gluten-free, which means all the delicious flavors minus the gluten. 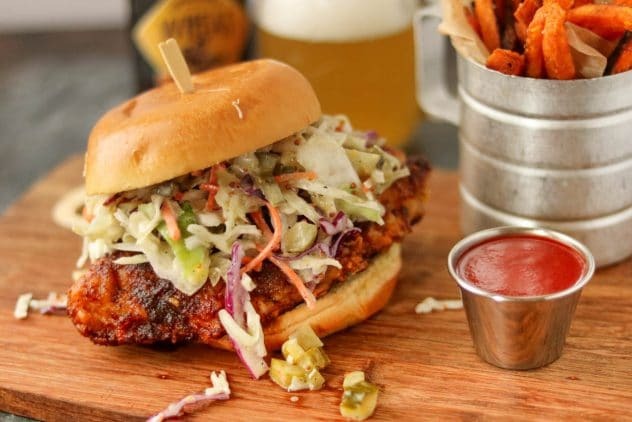 These Nashville Hot Chicken sandwiches will have your mouth watering, begging for more! 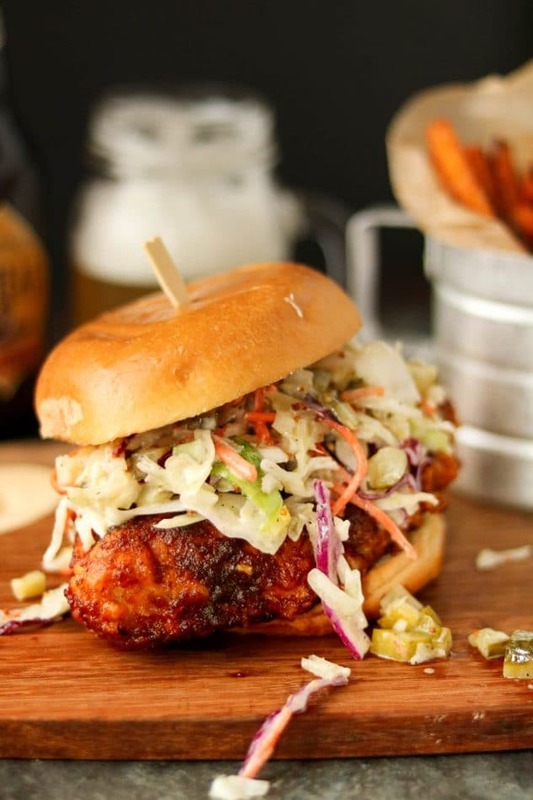 If you’ve ever been to Nashville, and you’re a foodie, you know that the Nashville hot chicken sandwich is a MUST try! I admit I’m a sucker for almost any type of hot chicken sandwich, so recreating this experience was a no-brainer. Top it off with this sweet and tangy mustard slaw and your taste buds will be in heaven. The rub and sauce combination for this is a combination of heat + sweet, which makes the flavor combination amazing. The creamy mustard slaw helps balance out the heat and provides a creamy sauce component because if you’re a sauce addict like me, you’re always looking for that creamy addition to finish out each bite. Add in your favorite side, in this case, I added in sweet potato fries and of course topped it off with a cold craft beer from our favorite local brewery, Boulevard Brewing Company. Although, with the flavor party going with this sandwich you won’t even notice your sides. 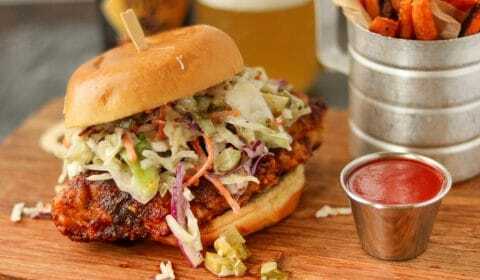 The perfect copy-cat recipe for the famous Nashville Hot Chicken sandwich. Rub both tbsp. of salt and pepper all over all four chicken breasts. Set aside. In a small bowl, whisk together the coconut milk, eggs, and 1 tbsp. Louisiana Hot Sauce. In another bowl, combine gluten-free flour and 2 tsp. salt. In a large skillet, heat 1 1/2 cups avocado over medium-high heat. Dip the chicken breasts into the flour mixture, then into the milk mixture, then back into the flour mixture one last time. Place into the hot oil and cook 7-10 minutes per side or until chicken breasts are cooked through. While the chicken is frying, in a small bowl combine all slaw ingredients and mix well. Store in the refrigerator until ready to serve. In a small bowl, whisk together 1/2 cup avocado oil, cayenne pepper, brown sugar, paprika, garlic powder, plus 1 tsp. each salt and pepper and 1 tbsp. Louisiana Hot Sauce. Once the chicken is done cooking, remove from skillet and place onto a cooling rack to allow excess oil and sauce to drip. Using a brush, cover both sides of each breast heavily with the Nashville Hot Chicken sauce. Add to bun, top with slaw and serve immediately.